The useful thing with this breadth metric is that deterioration in unemployment is made visible long before it shows up in the average national unemployment rate. 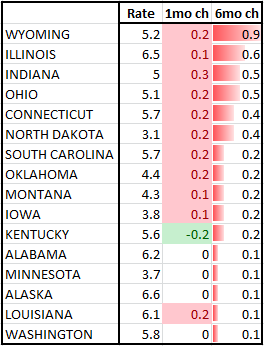 Whereas the national unemployment rate is at best a co-incident indicator for recession, the percentage of states with increasing employment acts as a reliable leading indicator – reliable enough to be added as one of the 21 components to our New Long leading Indicator. 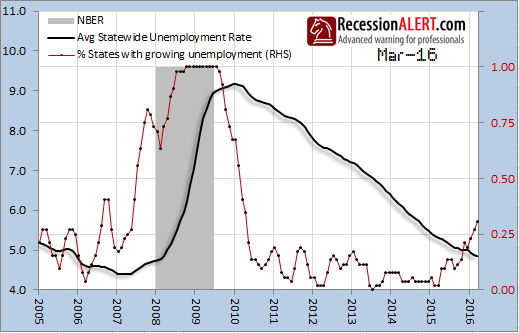 The deterioration in this unemployment statistic is corroborated by several others we covered in a blog posting last week, titled “Labor market not as strong as you think“.